The Metropolitan Museum of Art of New York, colloquially "the Met", is the largest art museum in the United States. With 7.06 million visitors in 2016, it was the third most visited art museum in the world, and the fifth most visited museum of any kind. Its permanent collection contains over two million works,divided among seventeen curatorial departments. The Met's Asian department holds a collection of Asian art, of more than 35,000 pieces, that is arguably the most comprehensive in the US. The collection dates back almost to the founding of the museum: many of the philanthropists who made the earliest gifts to the museum included Asian art in their collections. Today, an entire wing of the museum is dedicated to the Asian collection, and spans 4,000 years of Asian art. Every Asian civilization is represented in the Met's Asian department, and the pieces on display include every type of decorative art, from painting and printmaking to sculpture and metalworking. The department is well known for its comprehensive collection of Chinese calligraphy and painting, as well as for its Indian sculptures, Nepalese and Tibetan works, and the arts of Burma (Myanmar), Cambodia and Thailand. All three ancient religions of India – Hinduism, Buddhism and Jainism – are well represented in these sculptures. From the Indian Art one of the most elegant Collection is the one of Kashmiri Stone / Bronze and other sculptures which underline the development of this Art by the Kashmiri Carftsman who were without any doubt one of the best when it came to sculpting Stone and Metal. Some of the pieces are Cataloged as under. This diminutive panel depicts the Buddha’s descent from Trayastrimsha heaven, where he visited to preach the Buddhist gospel (dharma) to his mother, who had died soon after his birth. The three steps below his feet indicate the ladder upon which he descended. This miracle was widely depicted in the early Buddhist world. Here, umbrella and flywhisk bearers attend the Buddha, while airborne celebrants present garlands. Though rarely represented in Kashmiri art, Kama, the god of love, is here identified by a wondrous mythical creature (makara), who spews arrows from its jaws. The bow and arrow and a pair of lovebirds are Kamadeva’s principal identifiers. This subject is a rare survivor from early medieval Kashmir. A major Buddhist monastery and stupa site was excavated at Akhnur (Akhnoor), near Jammu, revealing a series of both large- and small-scale terracotta reliefs decorating the monuments. These heads once formed part of those sculptural programs and likely depict Buddhist laity. This powerful figurine is best understood as the Mahayana bodhisattva Vajrapani, who appropriated the lighting-bolt scepter (Skt: vajra) of Indra, the Vedic storm god, and repurposed it. Its meaning shifted from that being associated with the life-affirming power of storms (e.g. the monsoons), to the Buddhist savior Vajrapani, who facilitates journeying the path of enlightenment and aiding crystal clear thought as penetrating as a lighting strike. In this, among the earliest representations known from the greater Kashmir world, the double-ended thunderbolt symbol is imposingly large, the shaft of which extends the length of Vajrapani’s figure. In addition to the massive device with its distinctive prongs, the bodhisattva holds a rosary (aksamala). His face is somewhat abraded but traces of a moustache remain, and he wears a distinctive headdress of an elaborate cockade with hanging strings of pearls disgorging from the center, in the Gupta-manner. Large annular earplugs, also of known Gupta type, are shown frontally. He wears a sacred cord (yanopavita) and short waist cloth with a sheathed dagger secured in the belt. In his raised proper left hand he holds the oversized vajra, and his head is framed by a large unadorned circular halo. This object is from a rare group of early Brahmanical masks. The small fangs seen rising from the corners of the open mouth and the exposed upper teeth identify this deity as Bhairava, a wrathful form of Shiva. Such masks were employed as temporary fixtures during worship and used to enliven processional icons in the Brahmanical cultures of northwestern India and the territories of Gandhara in Pakistan. 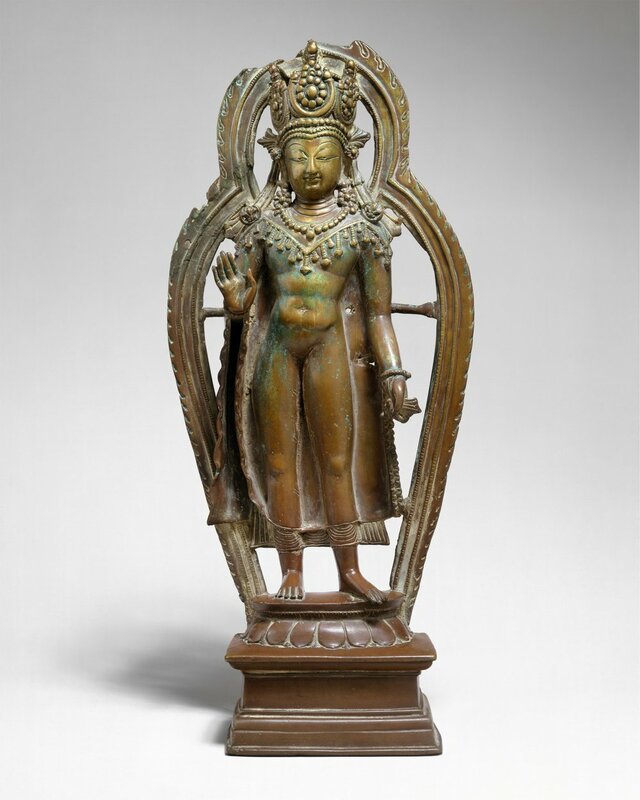 This bodhisattva, holding a lotus (padma), likely represents Avalokitesvara Padmapani. Portable images stylistically related to this one circulated in Gandhara, Kashmir, and as far north as the Central Asian Buddhist kingdom of Khotan, an important trading center on the Silk Road. Note: All pics and texts from the Met Museum.